We learn from geography classes that water bodies are marked with blue on the map. 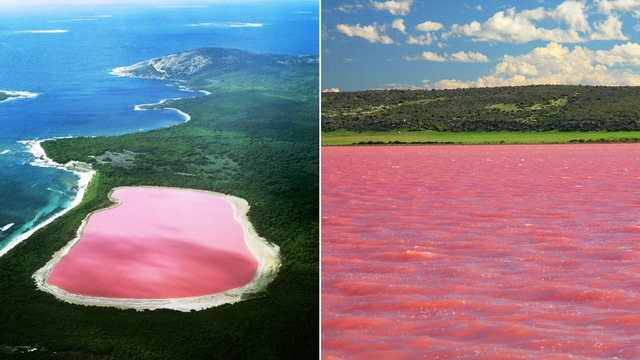 But nature likes to mess with us and creates oddities just like Lake Hillier in Western Australia. With its mere 600 meters in length, Lake Hillier is not one that will impress you by its size. Nor will it impress you by its diverse fishes that inhabit it. Lake Hillier delights your eye with its pink colour. Moreover, it lies just next to the Pacific Ocean, thus if you watch it from above, the contrast between the mellow pink of the lake and the blue of the ocean is striking. The Hillier Lake was first discovered in 1802 by navigator and cartographer Matthew Flinders who took samples from the lake and mentioned its existence in his journal. The lake is located on Middle Island, off the coast of Western Australia. As noted above, the Hillier Lake is quite small, its length is 600 meters and its width is no more than 250 meters. It is surrounded by eucalyptus and paperback trees and the ocean on its northern part. Its pink color is less accentuated when viewed from the surface but it is very prominent from above. However, unlike other pink lakes around the world, its water is still distinctively pink even when it is in a glass. For a few years they used to extract salt from the lake but nowadays it is only used for tourism purposes. The water of the lake is otherwise clear and it causes no harm to the human skin and the Dunaliella salina alga is completely harmless as well. In fact, swimming in the lake’s water is safe and fun but impossible to do for normal tourists as the lake can’t be visited. 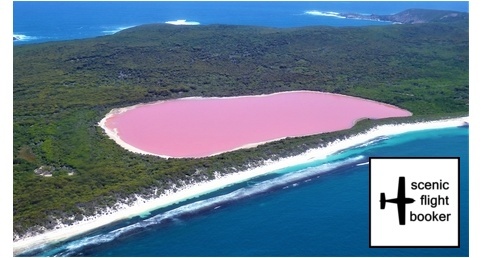 • Lake Hillier is not the only pink lake in the world, for that matter, it is not even the only pink lake in Australia. • For a period of six years, in the early 20th century, salt was mined from the lake, but it is not anymore.